Participants in Oman Conference for Economic and Free Zones discussed the promotion of the competitiveness of the Special Economic Zone of Duqm (SEZD) and the free zones in Sohar, Salalah, and Mazyouna and the industrial estates in the various governorates of the Sultanate. Participants in the conference, held under the patronage of His Excellency Dr. Ali bin Masoud Al-Sunaidi, Minister of Trade and Industry, affirmed that the Sultanate enjoys many comparative advantages that contribute to enhancing the performance of economic and free zones and provide many investment opportunities for economic diversification. H.E. Dr. Al-Sunaidi, Minister of Trade and Industry, said that the three main economic zones in Duqm, Salalah and Sohar would be an important factor in attracting investments not only in the manufacturing sector but also in the other four sectors, which are the focus of the current five-year plan: tourism, logistics, mining and fisheries. "These zones are an opportunity to maximize the benefits of the Sultanate's distinguished relations with the world countries along with the advantages enshrined in free trade and technology transfer agreements. They also avail from the membership of the Sultanate in the Arab and GCC economic communities," said Al-Sunaidi in the opening speech of the Conference organized by the Special Economic Zone Authority in Duqm in cooperation with Free Zone Watch (FZW). Al-Sunaidi said that the Sultanate has intensified in the last three years its attention to economic diversification by focusing on investment in five promising sectors, namely manufacturing, tourism, logistics, fisheries and mining through the National Program for Enhancing Economic Diversification (Tanfeedh). It involved the private sector in this program while maintaining government expenditure on infrastructure and exploration and production of oil and gas. He pointed out that Oman, like other world countries, has faced the challenges of bearish oil prices and managed through a package of measures to overcome these challenges, pointing out that the Omani economy began to recover and recorded good growth during 2017 expected to increase during the coming period. The Minister of Commerce and Industry highlighted that the Sultanate has adopted during the past three years a package of measures to enhance the performance of national economy. These included focus on the completion and development of free and industrial zones, encouraging foreign investment and facilitating the establishment of economic activity. The government has also adopted innovative means of financing for the establishment of some service facilities, such as hospitals, ports, economic and industrial zones, providing public transport and providing electricity and telecommunications services. The Conference attended by about 250 people from the Sultanate and abroad reviewed the successes achieved by the economic and free zones and the challenges they face. H.E. Yahya bin Said Al-Jabri, SEZAD Chair, said "The Conference aims to shed light on the Omani experience over three decades in establishing and management of free zones, industrial cities and special economic zones. It aims to activate dialogue on the successes achieved by these systems to the present time, as well as the challenges facing them in the next phase, draw lessons, and then submit the views on the mechanism of maximizing their contribution to the GDP of the Sultanate and reaching the vision of Oman 2040. In his speech at the Conference, Al-Jabri asserted that the free zones in the Sultanate, SEZD, and the industrial estates of the Public Establishment for Industrial Estates (PEIE) are the main building blocks of Tanfeedh. It is necessary to add another main building block represented in the seaports in Sohar, Salalah, which in total constitute a system for stimulating investment and business development, linking the Sultanate to the supply chain and value added at the regional and global levels. This would surely employ the comparative advantages of the Sultanate in terms of political stability, distinctive geographical location on global navigation routes, safe supply of energy, and preferential trade relations under bilateral and multilateral free trade agreements that allow access to consumer markets with a population of about one billion people." Al-Jabri explained that the system of free zones, SEZD, industrial cities and major ports in Sohar, Salalah and Duqm, is only a vital area and spatial space through which government policies can interact in the field of economic diversification in an integrated and organic manner to bear fruit on the ground in the form of high value-added productive projects. The first session included presentations from SEZAD, Free Zone in Salalah, Sohar Port, Free Zone in Sahar, the industrial estates of the Sultanate and the Free Zone in Mazyouna. This session focused on the potentials of economic and free zones and their efforts to attract investments and the advantages and facilities they offer to investors. The second session discussed the role of infrastructure and logistics in activating business in the economic and free zones. The third session reviewed the role of the banking sector in encouraging companies to invest. The session confirmed that the recent period has witnessed easing of some restrictions on financing, which contributed to providing more liquidity to investors. In their discussions, the banks stressed that they are a major contributor to development and project financing asserting that they consider the feasibility of projects before financing them. The fourth session, entitled "Digital Free Zones," discussed the investment opportunities available in the economic and free zones for investment in the field of ICT. In their interventions, the speakers stressed the importance of these zones becoming digital zones, pointing out that the interest of companies in this sector contributes to reducing costs. The day after the Conference, the participants visited SEZD to see the projects and the investment climate. "I believe that such visits play an important role in informing investors about the business environment in SEZD and the advantages therein. The projects here are growing and this is an indication of the success," said Young He Lee, Director General of the Korea Trade-Investment Promotion Agency (KOTRA). "This is my first visit to the Sultanate of Oman and I was impressed with what I saw," said Arslan Derhkam, a member and president of the International Iranian University. 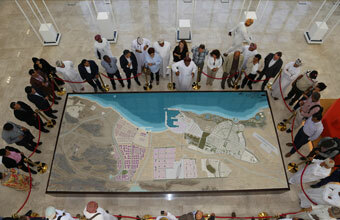 "The investment climate in Duqm is good and I expect its business environment to make great progress. The strategic location of the port would contribute to the growth of SEZAD." Pranay Pradhan, General Manager of SIMAC India, said: "I have business with a number of projects in Duqm. In fact, SEZD is rich in successful investment opportunities and I believe that in the next five years, it will be one of the most successful economic zones due to its strategic location serving the various industrial and logistic activities of the Gulf countries, Africa and Indian sub-continent."